NASHVILLE—The numbers paint a pretty stark picture: Despite making progress, healthcare still has a tremendous gender gap in the C-suite. 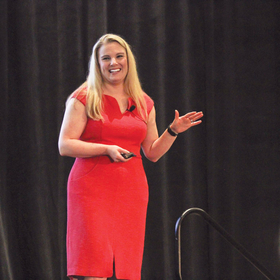 Kinsey & Co. “The case for gender diversity has to be made, and it has to be made compellingly,” Jennifer Stanley, expert partner at McKinsey, told the nearly 300 executive attendees at Modern Healthcare's Women Leaders in Healthcare event this month in Nashville. Companies must set targets to promote diversity and hold someone accountable for meeting those goals, she said, adding that there's strong evidence that companies perform better financially when their leadership positions reflect gender and ethnic diversity. Frontline managers should be trained to be aware of unconscious bias and call out behavior that's not inclusive. During the event, Providence St. Joseph Health announced its new #NotHere campaign to give female employees in the system a voice if they are sexually harassed. But more importantly, the system's leadership is committed to creating a workforce where that behavior is not tolerated. The campaign encourages anyone who sees threatening or inappropriate actions to come forward and make formal complaints. Debra Canales, the system's executive vice president and chief administrative officer who is leading the #NotHere campaign, said that every caregiver knows sexual harassment has no place at Providence St. Joseph Health. The makeup of the system should make it a little easier to implement more stringent policies. About 75% of the entire Providence St. Joseph workforce and more than 50% of senior executives are female. Christine Malcolm, executive director of the Carol Emmott Fellowship for Women Leaders in Healthcare, urged the audience to include men in the fight against sexual harassment. Malcolm recalled that during the women's movement of the 1970s, women activists unwittingly alienated men who were sympathetic to their cause by signaling that “we had it handled; that we didn't need them,” though enlisting men's help could have driven change further and faster. She said inviting men to join women in the #MeToo and #TimesUp fights against sexual harassment and assault is critical. Keynote speaker Dr. Claire Pomeroy, president of the Albert and Mary Lasker Foundation, said overhauling the healthcare system requires the full participation of women leaders. Speakers also urged executives to take charge in creating a healthcare system that keeps people healthy by looking beyond clinical processes to factors like education, access to nutritious foods, safe housing and jobs. 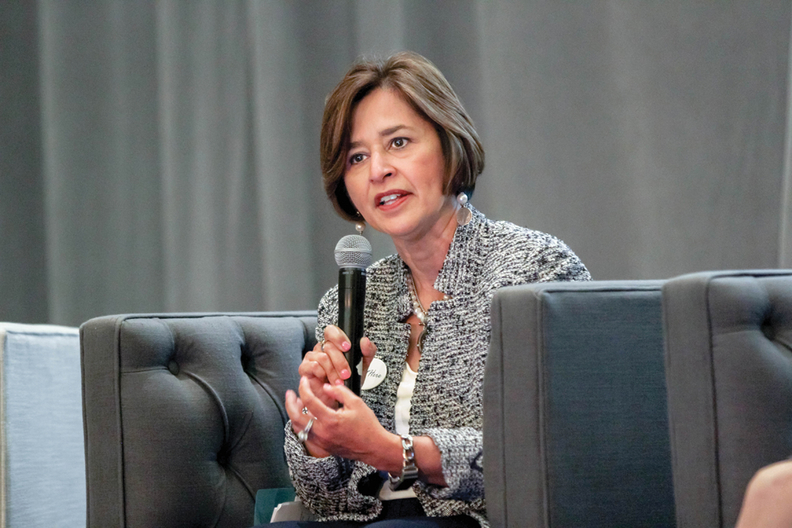 Dr. Karen DeSalvo, former chief of the Office of the National Coordinator for Health Information Technology, spoke of her experience taking care of New Orleans residents in makeshift clinics after the flooding following Hurricane Katrina devastated the city in August 2005. That informed her vision to remake the city's healthcare system into one that meets patients out in the community and focuses not only on physical health, but also mental health and social needs. DeSalvo, who was a professor at Tulane University School of Medicine when the storm hit—and years later would become New Orleans' health commissioner—led efforts to set up clinics on the streets once it was clear that the city's Charity Hospital, which long served as an anchor facility for the low-income uninsured, wouldn't reopen because of flooding. Doctors, medical students, volunteer nurses and social workers rushed to care for the residents who stayed—the seniors with multiple medical conditions and the poor. She witnessed best practices outlined in literature come to life: they were working in teams and thinking about people and populations holistically while seeking to understand the context of their lives. Dr. Mandy Cohen, secretary of the North Carolina Department of Health and Human Services, echoed that sentiment while speaking about her mission to remake the state's Medicaid program to focus on the social and environmental factors that influence people's health. To that end, North Carolina's Medicaid managed-care organizations will be required to screen every beneficiary for access to food, stable housing and transportation once the state transitions from fee-for-service to managed care in 2019, depending on regulatory approval. The department also plans to run regional pilots to test which food, housing, transportation and violence interventions would best improve beneficiaries' health outcomes and reduce costs. She stressed that the endeavor she's undertaking in North Carolina isn't especially innovative, as the importance of social determinants to a patient's outcomes has been widely accepted. But the actions Cohen is taking are the result of leadership and deliberate choices to improve the health of the population. “Social determinants will remain a buzzword, with isolated pilots—very successful, but isolated pilots—interesting fodder for conferences until the people here in this room today decide to exercise the leadership to make change happen,” Cohen said.